I liked Curata, but it depends on the use case of how it will be used as to how effective it is for someone. If you are trying to curate content it works great. Had I not been so put off by the issue mentioned earlier I would have given more effort to learn the CMS, so I am not sure how effective it really is. Allows you to curate content and narrow your search parameters to pretty specific areas. It learns your selections and overtime serves up better and more relevant content. It works very well with WordPress, it integrates smoothly and allows you to share content on the fly with their Chrome plug-in. Curata's support is great, if you need them they will help out quickly to resolve your issues. For me the product worked great for what I needed it for, I no longer needed it and was a few days past their renewal date (you have to cancel either 60 or 90 days before the end date of the contract) and they would not work with me. They took the stance of, "Too bad, so sad." They offered me their CMS along with their CCS for this last year, but we never fully used it and was turned off by the lack of customer service initially in this situation...especially after it was a matter of around 10 days or so that I was late. Having to keep reconnecting LinkedIn would throw me off at times. Sometimes the article I was trying to post to WordPress would get hung up and I would need to get a hold of support to help clear the system. I would say neutral for us, but more so because of how we were using it and it being a stop-gap fix for us. 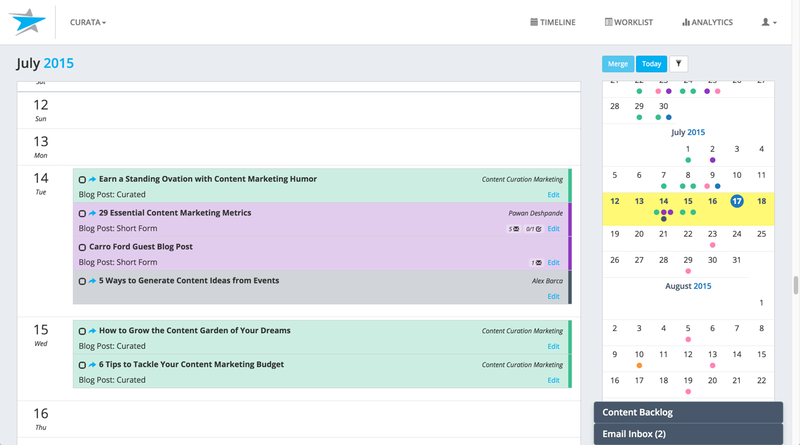 Curata CMP content marketing platform: Editorial calendar to optimize content production.